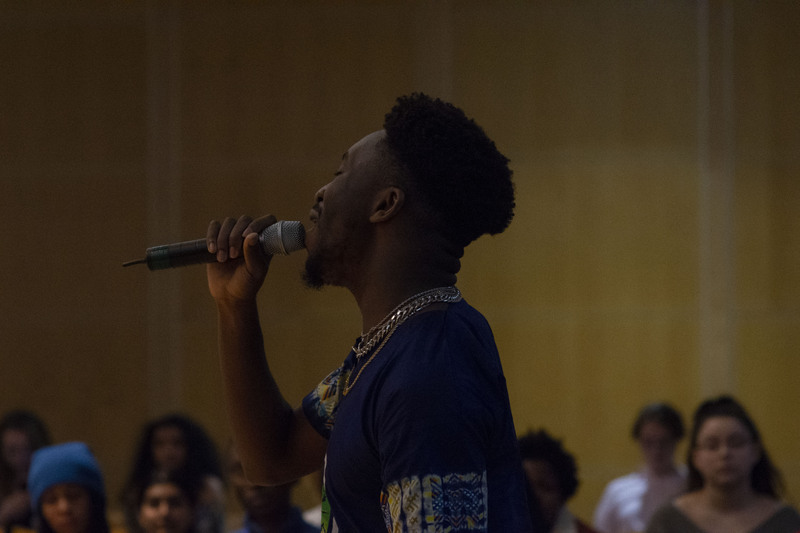 CHARLES OMOREGBEE '21 PERFORMS for a crowd in the McNeil Room. The first thing I heard when I walked into the McNeil Room on Saturday evening was the smooth harmony of jazz floating throughout. The tables had been cleared away, replaced by rows of chairs facing the illuminated center. The room was packed, which isn’t exactly what I expected when I think about cultural events at Rensselaer. People from all sorts of groups around campus had made it today, both to perform and to cheer on their friends. It was invigorating, and almost feels like coming home. Family, love, and friendship seemed to be the spirit of the night, as the event opened with some poetry. People came up to tell their stories, and in between the varied slang, rhythm, and styles, ran very common themes. Love and heartbreak, success and failure, finding yourself; it was almost humbling. It reminded everyone in the room that we’re human, and the same. Continuing with this spirit, RPI Sangam presented an Indian classical dance performance, #neveragain, a social commentary on school shootings. Empathic and touching, it definitely struck a chord with the audience. They were followed by 8th Wonder, a dance group on campus that performed a mix of pop songs from around the world. A fun, energetic performance, they had everyone on their feet for a standing ovation. The last form of free expression was through music. While I’m hard-pressed to find a single highlight for the night, the “Rapping Professor,” Aaron Smith from Temple University, definitely made an impact. His performance was loud, fun and flamboyant, much like the man himself, but he left the crowd with a lot to think about, like the importance of history and embracing your roots, self-love and never forgoing your individuality. He inspired a lot of people that night. The Night of Free Expression did a lot of things; it showcased a wealth of talent I didn’t know existed and gave a lot of people a platform to express themselves. But, it also brought us together, as a community of diverse people who all shared what it meant to be human. Despite how different we may seem, we’re feeling the same things, going over the same hurdles, and there are people out there who can understand.